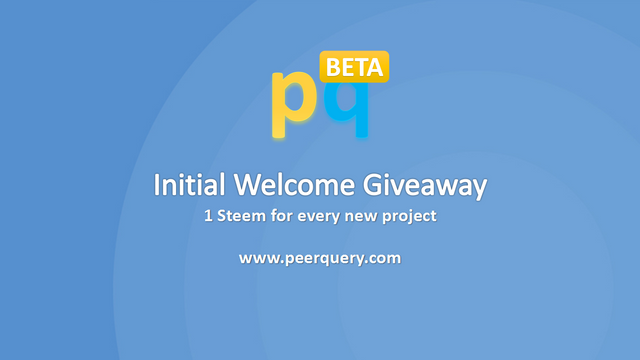 Well, it so happens that Peer Query is doing a 40 Steem giveaway for our initial adopters. Initially, we were a tag browser which allowed users to browse and create QA themed content. We have evolved into a platform for Peer to Peer collaborations. Come, create a project or query. Invite your peers to join in your cause. Share project progress and get rewarded by the community as well as our curation team. We would be providing support for projects in every way we can: making it easy for them to recruit members, project financing, community building, and promotion. This is not a money give away. Peer Query is built on Steem, and Steem tokens are the currency of the blockchain. This giveaway awards 1 Steem token to every user whose work is curated; as a medal of participation. This is our(and my) first giveaway; if there would be any future such giveaways they will be influenced by the outcome of this one. Hopefully, we will soon get our curation service up and running in days, then we could have an established reward system to further incentivize adoption. This package is to invite Steemians to bring their projects onboard Peer Query. Peer Query was built for Steemians and we are welcoming Steemians to come to try the beta launch. Our selection algorithm for featured projects are projects which have the fields of website, Steem account, and a Facebook page filled. For featured reports, the report must be linked to a project, which is done during the report creation. Kindly remember to fill the needed fields to make your projects list on the home page as well as among the "featured" category. Currently, there is no reward splitting or fees with Peer Query so come on; create your first project and report! Please note that Peer Query is a Ghanaian venture; my curation will respect the laws of Ghana. Peer Query is in the very early beta. Lots of functionalities, support, and usability documentation are still in the development phase to be shipped as soon as they are complete. Please don't expect much yet. If you encounter any challenges, bugs or have any questions that are not answered by our FAQs, please reach us in Discord or by Facebook messenger. We have already made the shift from being a tag browser into a platform. Peer Query is not the traditional project management products such as Mondays.com or Jira. Peer Query's vision is to provide a place to list a project, invite like-minded peers to join as well as access a minimal form of compensation for the work of your contributors. You can invite other users to join your project; you can list queries such as bounties or even job vacancies. As your project evolves, you can write reports on your progress to the community. Peer Query provides a centralized interface to discover as well as build and organize projects along with their communities. Our upcoming curation service is to curate and reward(upvote) the most incredible project reports. Curator is being completely re-written and we are now at version 4.9.0, way ahead of the last version 3. Currently, it is being tested and when ready we will commission it into use for curation on Peer Query. full payment model where the Curation team members, the sponsors, and the authors all get compensated! Curator 4+(in testing and almost done) is even better now with code linting and webpack babel build of scripts and assets, several Improvements as well as several critical bug fixes from the earlier versions. We are building a curation team primarily consisting of curators. If you are interested in curating project reports on Peer Query when our curation service is up, please join our Discord channel and make your intentions known. Thank you for making time to read. Now, let's see what you come up with: Peer Query. A million thanks to the Steem community, the devs, witnesses and whales for their support so far. Special thanks to @Transisto, @BlockTrades, @Ned, @pFunk, @Ausbitbank, @Drakos, @Utopian-io, @TechSlut and countless more. Also, special acknowledgments to @ChrisAiki for his pro-activity with Peer Query. He has graced us by listing the environmental impact 2 million trees by 2020 project on Peer Query three week ago! During the first giveaway, he will receive 5 Steem. Peer Query production upgrade: collaborators, we are good to go! This is great. Some months ago I was thinking and talking that steemit per se can be used as a income project source. Now with your platform is a reality. It would be a pleasure to help you translate the platform in Spanish. This is the less I can do for now. I am pretty sure many Spanish speakers would love to get into it. Let me know how do we proceed? One question: what about food community project? Is it possible to do this? I have 3 friends whom attend a public food centre. In this place they feed around 45 old people. They have been working asking donations and this could be a great opportunity to take their project to a whole new level. PS: My Next post about steem possibilities will talk about this. yes! you can create a project on any project you believe in. Hi there thanks for answering to me. I will tell my friends so they can write the project. It would be a pleasure to help you translate the platform in Spanish. Let me know how can I help you with that? this looks like a great initiative, hope you get the required visibility and support. good luck and best wishes! thank you. i hope to see you participate as well!? I tried to follow along the post and the website but I still don't quite grasp the mechanics of this project, can you illustrate how this will work with an example ? for the example, I will use Curator which would soon be listed. after listing Curator on Peer Query, we would then invite the contributors to be acknowledged on the listing. contributors of Curator could write about their work progress and other blogs about Curator. each report(post or blog) would be reviewed by our curation service/team, while the Stem community can support their work with votes and comments. in addition to blogging about project updates, they can create queries; like "we are for a new UI designer", or "we are running a bug hunt bounty". queries also used to be Steem posts, so users can vote and comment on it. however, due to the initial RC limits of HF20, they were separated from being posts. I guess that I am running low on imagination juice..can't say I got all of that but I will stay tuned to see how it pans out. What would help is if you can explain the incentives for actors to perform actions in the above example.